Hei, oikein mukavaa sunnuntaipäivä! Tervetuloa huhtikuun Penny Black and More haasteen pariin. Kaikkea keväistä aihetta halutaan nähdä leimatuissa korteissanne. Hello, first Sunday of the month - it's time for new Penny Black and More April Challenge. "All Things Spring" is the theme - and remember to use a real stamp on focus. Our sponsors are Penny Black, Crafty Ribbons, Tattered Lace, Stix 2. Bright, happy and cheery Mervi and a great design as well. I love this image Mervi it oozes Spring and is very versatile. I like the matching colours and embellishments too. This is so cute, love the lace and ribbon and amazing coloring! Beautiful stitched border too! What a darling image. Fabulous job! Thanks for sharing with us. I hope you'll join us again soon, as I look forward to seeing more of your wonderful art. 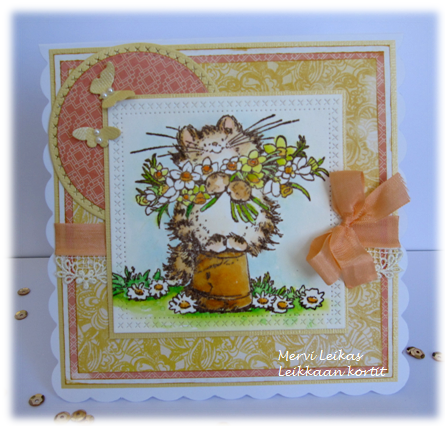 Really beautiful card Mervi, super image, gorgeous papers and design. Oh my this is cute !!! Adorable little cat and love the design. Cute and happy card - lovely. Just adorable - I like your sweet colors! Thank you for joining us at Really Reasonable Ribbon! What a pretty card, love your papers and design, and that's one of my favourite images.